Located in the quiet, less populated southern part of the island but is still less than a half mile from the border of Beach Haven border. 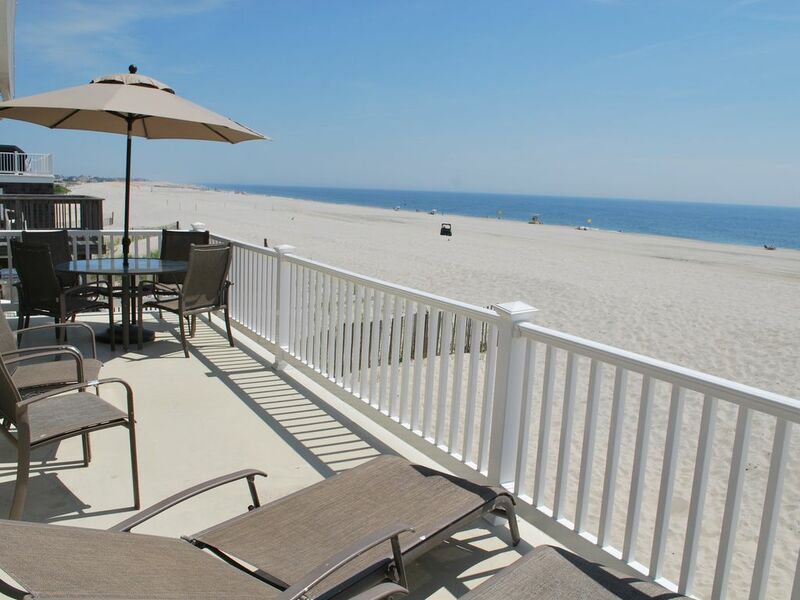 This provides easy access to evening entertainment since Beach Haven borough is home to the island's only amusement park, two shopping villages, and many restaurants. The property has deeded, private access to the beach. Many amenities are supplied to minimize your packing requirements to spend a stress-free, relaxing week overlooking the Atlantic Ocean. Main bathroom with shower and tub plus a second 1/2 bathroom in the master bedroom. Additionally, there is a private outdoor shower. (4) Plasma flat screen televisions are located in each bedroom and the family room. This experience with staying here was excellent. I diagnosed with double pneumonia prior to my vacation but determined I was still going. The doctor told me to rest and with this view of the ocean that is exactly what I did. The view of the ocean from the balcony is so beautiful that pictures don't do it justice especially the sunrise. It is right up the street from the end of the island so you can watch the sunset on the bay. It is also close to a lot of the stores for shopping, grocery store and restaurants. The owners of this property are wonderful to work with. I would highly recommend this to everyone not just on season but also off season. I love the beach in the fall. This is truly oceanfront with direct access to the beach. Had a fabulous stay here, highly recommend!!!! We really enjoyed staying at this functional and attractive home right on the beach with such easy access! The accommodations were clean and the view was gorgeous. There is plenty to do, but it is also a quiet area of LBI. The outdoor shower and washer/dryer were very helpful. Our family had a wonderful time and we would absolutely choose to stay here again. Excellent location, clean and well equipped! Location was perfect! I grew up with a summer house on LBI in BH Gardens on the ocean, and this house did not disappoint. I was able to sleep with the sliders open every night and go to sleep with the sounds of the ocean waves crashing on the beach just as I wanted and needed. There is private beach access. Beds range in size from queen to twin and were comfortable, kitchen was well equipped. The outside shower was even better than the one inside. The washer and dryer were very convenient and separately available for each unit. The deck was an oasis for morning relaxation and tea, as well as evening cocktails. I have two minor issues: 1) there is no clothesline to hang wet suits on and 2) the living room furniture could have been a little more comfy for lounging. However, neither of these issues will stop us from staying here again. I highly recommended if you are looking for a quiet relaxing stay on LBI!!! We really enjoyed our stay - can't beat the ocean views, and the apartment was everything we had hoped for.